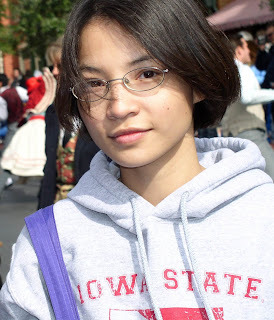 Meet Ngoc Phan, 26 years old, of Iowa. She was born in Vietnam and was nice enough to send us a mini-guide to the country. Here are her picks on where to go and what to do in this Southeast Asian locale. Thanks Ngoc! LANGUAGE: Vietnamese is the official language. Other languages include French and Chinese. A lot of people speak English there too, especially in the South. Ha Long Bay. One of the world’s must see natural wonders! Hai Van Pass in Quang Nam. This is the highest and longest pass in Vietnam. This pass also separates the North and the South parts of the country both geographically and climatologically. There are a lot of wildlife in the area (Lang Co Lagoon) and white long beaches (Son Tra Peninsula, Da Nang City). Ke Bang National Park and the marble mountains in Phong Nha. Saigon City. It’s good to hire a combination cyclo driver and guide to take you around the city and it’s inexpensive. Annam/Da Nang Province, which is about 7.5 miles west of Da Nang City. Ngu Hanh Son or Mountains of the Five Elements. Each is named after a Vietnamese folklord: Water (Thuy Son), Wood (Moc Son), Metal (Kim Son), Earth (Tho Son), and Fire (Hoa Son). Thuy Son is the highest one with steps cut into it that lead to the Tham Thai Pagoda and Huyen Khong cave. Inside the cave are shrines, statue guards, and Buddhas cut from the local green or white marble. Most of the beauty here is of natural type. If you want to see the older architecture, Hue is probably your best bet. Vietnamese food is very good…it also depends on where you get it. Don’t be discouraged if the food in one area doesn’t taste good, because you may find the same kind of food in another area very good. You will find a lot of street vendors, and if you don’t mind an occasional fly here and there, the street vendors food is super cheap! Forget western food when you are there, not that I don’t like it, but I don’t think they are that great in Vietnam. One of the things that I look forward to when I go to Vietnam is definitely the food: traditional food, seafood, and fruits are top on my list. I generally don’t drink coffee, but I wouldn’t pass up a cup of Ca Phe Sua Da. A great place to visit and to shop is Hoi An. Of course it is always good to ask around for the best deals. This is also where your bargaining skills come in handy. This site will give you some insight into the country, places to visit, travel info, some of the hotels there and the cost, etc. Hope everything is going well! Happy travels!